Latest on Syria For Foreign Policy: Rebels, Inc.
For Syria’s armed opposition, business has become the key to survival. Unfortunately, that doesn’t always mean fighting Assad. The rebels in Syria have put in considerable effort to toppling President Bashar al-Assad, capturing several northern towns and cities and laying claim to some of the richest provinces in the country. Now they’re in trouble. When President Obama decided to relieve Assad of his chemical weapons rather than topple him, it confirmed to the anti-government fighters what they had always suspected: that the corrupt and ineffective Syrian opposition-in-exile has failed to lobby for military intervention; that the West favors a weakened, “secular” Alawite regime over a radical Sunni one; and that the rebels have become cannon fodder in a regional power struggle over which they have little control. To overcome their declining fortunes, the rebels have re-tooled their strategy. Their solution has been to place a priority on consolidating the territory they hold and establishing financing networks that will reduce their reliance on fickle overseas backers. The consequence of this strategic shift is what some Syria-watchers have called a “Darwinian shake-down”: small groups have coalesced around larger ones to create “families” of brigades, each with their own identity, organizational hierarchy, and sources of funding. There are now five principal rebel families: theIslamic State of Iraq and Syria (ISIS), Jabhat al-Nusra, Ahrar al-Sham, Jaysh al-Islam, and what remains of the Free Syrian Army. Each of these “families” is competing with the others for oil, wheat, and cross-border trade — assets that are now viewed as the key to long-term survival. The fate of the Farouk Brigades offers a case study of the forces at work. Once a much-vauntedgroup that received generous arms deliveries from Turkey, the Farouk Brigades was, at one point, the lynchpin of the West’s effort to build a “moderate” opposition. Instead of making the necessary alliances needed to carve out their own fiefdom in resource-rich areas, Farouk’s forces embarked on a disastrous war with two powerful families: Ahrar al-Sham and Jabhat al-Nusra. The war ended with Farouk’s expulsion from oil- and grain-rich Raqqa province; it also lost control over the vital border crossing at Tal Abyad that its fighters had liberated in September 2012. Confined to resource-poor and heavily contested Homs province, it failed to draw smaller groups into its orbit and grew progressively weaker, eventually splintering into bickering factions of a few hundred fighters each. The rebels call this process of decline tarahul, or “limpness,” and it often remains imperceptible to those looking in from the outside. Two a half years into the revolt, opposition-held Syria is Mad Max meets The Sopranos. Groups of brigades now fight the regime one day, fight each other over resources the next, settle differences the day after that, and then return to fighting the regime once more, ad infinitum. In theory, the Sunni rebels who dominate the opposition want democracy and/or Islam. In practice, they are unreconstructed small capitalists who are ripping apart the old state-run economy and creating in its stead a patchwork of fiefdoms where rackets and other profitable enterprises are pursued away from the dead hand of Baathist government — or, for that matter, of any government. This doesn’t bode well for the fortunes of the armed rebellion, which is in desperate need of centralized planning and leadership. Had American sports ever taken off in Syria, the “Euphrates Knights” would have been a pretty great name for a popular football team. In reality, it’s one of two dozen rebel outfits that operate out of Manbij, a city of 200,000 inhabitants 50 miles east of Aleppo. Shabby and polluted, the city is, like many of its type in the developing world, an experiment in modernity gone bad. But it’s as good a place as any to observe the dynamics now driving armed opposition factions as they desperately avoidtarahul and its deadly consequences. But those would-be rebels have been busy nonetheless. They may not have been fighting, but they’ve been hard at work on what Marxists might be tempted to call a “social revolution.” The rebel fighters — poor Sunnis drawn mostly from rural backgrounds — have long begrudged what they see as a systematic policy of discrimination in education and public sector jobs. They say that the ruling Alawites give preference to their own or other minorities, that the security forces were disproportionately repressive against Sunnis, and that they feel wronged by a system that denied them their fair share of the national wealth. It was this combination of factors, they say, that drove a third of all men in Manbij to search for work in places like Lebanon, usually ending up as low-paid day laborers or farm hands. But now that these same men have kicked the government out, the implications have been somewhat surprising. About five miles east of Manbij is an oil market. In an open expanse of land, sellers from Hassake and Deir az-Zour meet buyers from Aleppo and Idlib, ascertain the quality of the crude oil, agree on a price, and exchange bills. This market didn’t exist when the regime was around, since the state-owned oil company enjoyed a monopoly over Syria’s hydrocarbons. Now the oil wells scattered across Syria’s east and northeast are the property of whoever lays claim to them — and Syria’s five rebel families have been quick to act. The Aleppo-based Tawhid Brigade, for example, holds the al-Jabbul field east of Safira. The FSA-aligned warlord Saddam al-Nu’aimi controls the wells in Bukamal near the Iraqi border. And the al Qaeda affiliate Jabhat al-Nusra controls the giant Shadadi field in Hassake (albeit with ISIS now breathing down its neck). 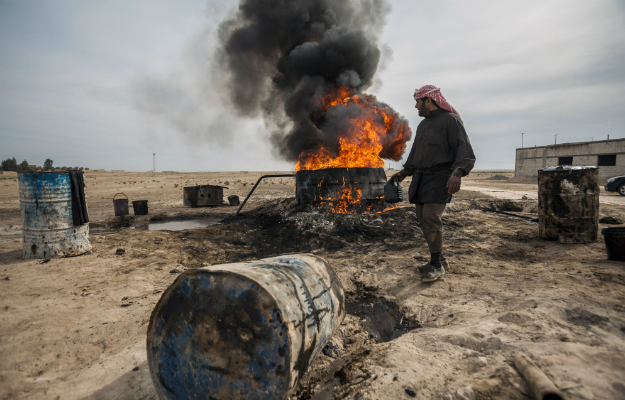 The small, low-tech refiners in the rebel-controlled areas face a daunting task as they try to turncrude into gasoline and other oil products using the most primitive (and dangerous) of means (as seen in the photo above). But if they survive the process unscathed, they can at least look forward to a decent profit. With the rebels selling a barrel of oil for anything up to $ 22, refiners can make a profit of 30 cents on every liter of gasoline sold to the public. Those who make their living from road haulage and associated trades have seen their business boom; body shops, for instance, can’t keep up with the demand from truckers who need giant tanks fitted to the backs of their vehicles. Unemployed young men can now make a living selling fuel from roadside kiosks, and mechanics have plenty to do in repairing engines damaged by the low-quality fuel. The free market that the rebels have unconsciously fostered is a win-win for suppliers (the rebels themselves) and consumers (everyone else). Too bad about the environment, of course — but that seems to be the last thing on Syrians’ minds these days. Hasan al-Ali, the Euphrates Knights’ founder and political leader, belongs to the social class that historian Hanna Batatu calls the “lesser rural notables.” A pharmacist by profession and the son of a clan elder of the Umayrat tribe, Ali was keen to cash in on the oil grab. He negotiated an alliance with Ahmad Issa al-Sheikh, the leader of powerful Idlib-based Islamist group Suqur al-Sham, who is linked to the Jaysh al-Islam “family.” Ali was partially hoping this new alliance could protect the Knights from al Qaeda. But the real motive for the move was all about business. Oil is not the only way that rebels can make money. Another outfit from Manbij, the Jund al-Haramein brigade, has gone in for the grain racket. In exchange for “protection” from other groups trying to force their flour upon customers, bakeries in the city are obliged to purchase flour sourced exclusively from mills controlled by the al-Harameins. And in case ISIS or Jabhat al-Nusra ever becomes unhappy about this arrangement, the al-Harameins can simply opt for protection of their own — by joining the Ahrar al-Sham family. In September, indeed, Jund al-Haramein announced that it was already affiliating itself with the larger group, a move that should suffice to deter any hostile action. How are the rebels spending their new-found wealth? Just take a look at the burgeoning car trade. In the bad old days, the government imposed duties as high as 300 percent on imported vehicles, so only a wealthy few could afford to own cars. When the rebels who now control the Turkish border scrapped the charge, Syria’s northern provinces became awash with second-hand cars imported from Eastern Europe, which retail for as little as $4,000 (for a cheap Korean model) to $8,000 (for a proper German mid-size). “Our money is being turned into steel,” complains Ali, who insists that proceeds from his oil venture have been going exclusively to supporting the war effort. But not all of his comrades are as scrupulous. Where they had previously struggled to afford motorbikes, rebel fighters are now seen driving BMW X5s. The downside to this explosion of entrepreneurial energy is that it comes at the price of actually defeating Assad. The Knights have had to withdraw their forces from the siege of a regime air base atKuwairis, east of Aleppo, to reinforce an attack on a troublesome army positioned in al-Shaer that was taking potshots at their oil tankers. Far more dangerous for the rebel cause as a whole is the steady erosion of morale and fighting spirit that occurs as brigades, having liberated their areas from the regime, find themselves using their military might to protect their economic assets as opposed to carrying on the fight elsewhere. The implications of this can be seen in today’s battlefield. The regime has begun a determined pushthrough the soft underbelly of the opposition-held north, capturing Safira and threatening to cut off Aleppo from the eastern half of the country. This will prove to be a rude wake-up call to the rebel groups in the area that had grown soft on the spoils of 12 months of liberation. Only planning at the very highest levels of rebel leadership can hope to save the day, but while meetings do sometimes take place between the heads of the main families, often under pressure from regional patrons, these are as much about PR as they are about actually taking action in any concerted or strategic manner. “None of the groups think that they’re going to be part of something,” says one rebel insider. “They all think they are going to be that thing.” It will be seen whether these leaders will ever regulate their rivalry by creating a body like the notorious Commission, the ruling body of the American Mafia. As things stand now, that would be the logical next step in the evolution of the armed opposition. Arabs pride themselves on a language that has not changed all that much in 1400 years. It remains tethered to the Qu’ran, that linguistic point of reference which stands out as a preeminent piece of literature as well as a divinely inspired book of guidance. If asked what made the Qu’ran so special, Arabs will invariably tell you that it is balagha, which translates as “eloquence,” and which in practice means conveying an intelligible meaning in as few words as possible. You may think that a self-appointed guardian of the Muslim faith—a member of the Muslim Brotherhood no less—would adhere to this linguistic principle out of reverence for the holy tongue if nothing else. But alas, doublespeak has an appeal even for religious zealots. “Mursi didn’t fail,” a Muslim Brotherhood stalwart told me recently, “he was failed.” This rather silly play on the words yafshal (to fail), and ufshil (made to fail), serves the purpose of stripping the former president of all culpability for losing power and plunging the country into crisis. It may sound catchy, but as a statement it makes no sense at all. “The slovenliness of our language makes it easier for us to have foolish thoughts,” wrote George Orwell. And that is the problem with Arabic when enlisted in the service of politics. All too often, it is used imprecisely or disingenuously, and the result is obfuscation and balderdash packaged in neat off-the-shelf sound bites. The problem is not, of course, limited to politicians. Arabic television channels and newspapers are full of the worst type of clichés that blur reality in the name of not wanting to cause offense. Countries engaging in deadly proxy conflicts are referred to innocently as “sides,” “players” or simply “regional capitals.” In the same vein, realpolitik becomes “the balancing game,” client groups become “political cards,” and issues, often affecting the fates of millions of people, become mere “files.” A deft politician aims to confuse his opponents by “mixing the cards” before “turning the tables” on them. According to this vision, politics is a game of poker played by bureaucrats. The Egyptian-Qatari cleric Yusuf Al-Qaradawi is something of a trend-setter in this regard, with publications from the 1970s with titles such as “Islamic jurisprudence between authenticity and renewal”, and “Contemporary ijtihad between discipline and neglect.” Al-Jazeera’s Arabic website has taken up the style with this elegant headline from October 26: “Egypt between Brotherhood-ization, Wafd-ization and militarization.” Appearing to steer a middle course (wasatiya) is a popular theme of Arab political culture; whether it is actually so, and whether it leads you anywhere, often goes unasked. What matters is the impression. The Arab Spring—if one could use such a term now—has not ushered in a new vocabulary befitting the new era of democratic change. The word “compromise”—an essential concept for any functioning democracy—comes from the Arabic root word “to come down” (nazala), and who would want to do that. The problem has not been alleviated by borrowing words from other languages where Arabic has not quite kept up with the influx of new concepts. “Pragmatic,” for instance, is widely used in the Arab world in its English form to describe a politician or political party, but in this usage its meaning is closer to “opportunistic” than anything to do with common sense. Even a word like “freedom” has become viewed with a degree of suspicion, users often having to resort to adjectives like “real” or “responsible” to make clear what sort of freedom they are referring to. All the while, words connoting violent confrontation like “resilience” (sumud), “resistance” (muqawama), “massing” (hashd) and “escalation” (tas’id) have lost nothing of their positive luster. If Arabic is to become an enabler in a new, more liberal political culture based on realism and honest pragmatism, Arab progressives should at least reflect that in the way that they use language. Their medieval juristic and scientific forebears have done so in the past; only slovenliness stops them from doing so in the future.